Since our beginnings in 2003, Enrollment Resources has kept an eye out for ways to better the lives of those around us. Many can make money with a business – it’s far more challenging to do so while improving community and environment along the way. That’s why we’ve risen to the challenge, certifying as a B Corporation (B Corp) since 2012. To that end, here are examples of how ER is committed to doing well by doing good. In 2003, co-founder Gregg Meiklejohn graduated from Leadership Victoria, a one-year extensive program that helps to build community capacity. In the years since then, he’s served on the Leadership Alumni Committee and is an active mentor. Enrollment Resources has chosen to work in the Career School industry. Schools in this sector work with a diverse population of visible minorities, single parents and those facing financial challenges. We could work in any sector, but choose to advocate for those who help people get a leg up in life. We donate to community charities each quarter and keep abreast of emerging community trends through our Community Capacity Advisors. We often invite Community Service Agencies (CSA) to come to our office for a process called a Synergy Session. This involves focusing the entire office on problem-solving for the CSA. We break up into teams that draw out issues and advise on ideas, which the CSA can put to immediate use. We strive to use green standards in all of our office practices, including being mindful of green materials when building our offices. We are members of the Better Business Bureau, and one of our Executive Team sits on the BBB Board. Paid Community Days are available to our staff, which they can use to work on a community-improving volunteer activity. So many businesses these days claim they are socially minded or environmentally friendly, yet they don’t stand up to scrutiny. The term for this practice is “greenwashing”. Enrollment Resources has gone to great lengths to prove we walk our talk, and improve on our performance year after year. Enrollment Resources was the first marketing company in the world to be certified as a B Corp in the Autumn of 2012. The B Corp movement is not for the faint of heart. This not-for-profit certification body runs a rigorous certification audit (Impact Assessment) of a business’s effectiveness as it relates to community leadership, environmental stewardship, worker relations and governance practices. The B Corp movement ensures business candidates meet and maintain standards as triple bottom line organizations. Every two years ER gets a random site visit as part of our recertification process. We are proud of our years as a B Corporation, standing alongside leaders such as Ben and Jerry’s Ice Cream and Patagonia. In fact, Enrollment Resources has won multiple Best For the World awards over the last six years including Best for Workers, Best for the Long Term/Governance, and Changemakers. Best for Workers shows we are a great place to work and, because of that, we retain our talented staff and attract great people. We understand that the quality of our relationships with clients and each other is paramount to our success. It also reflects our Culture of Innovation. Our staff can take risks without putting their career on the line, creating energy, enthusiasm, and way better ideas than our competitors. Best for Governance recognizes that we are operationally well-managed and meet our goals for clients – more qualified leads, improved contact rates, engagement and enrollment conversions. Best for the World: Changemakers reflects our core mission in business to find the most profitable, ethical and effective avenues of improving Enrollment Management performance. We operate in a business manner that gives clients control over their assets and the freedom to break free of dependence on outside agents (including us). Because we are a leading innovator in internet marketing for the Career Education Sector, our clients enjoy increased student enrollment and revenue without having to spend more on marketing or hire additional staff. Best of the Best – that’s pretty cool! 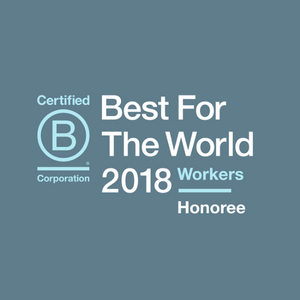 Co-founders Shane Sparks and Gregg Meiklejohn care deeply about the people who work at Enrollment Resources; we’re grateful to have the B Corp movement acknowledge us in this way.